« Hillary as a write-in for the Iowa Caucus? Wow! Jobs resigns as CEO of Apple, Inc.
Steve Jobs, who has revitalized Apple over the last 14 years and made it one of the most successful and most talked-about companies in America, has stepped down from the CEO position. He has been ill for some time, originally from pancreatic cancer. He received a liver transplant and has been treated in a variety of ways but he and Apple have been very close-mouthed about his health situation. Tim Cook, COO, has been moved up to the CEO position. He had been running Apple since January when Steve took a leave of absence. 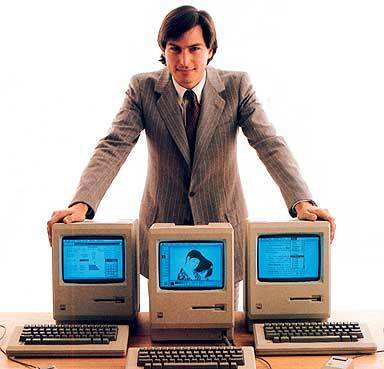 Steve remains as Chairman of Apple’s board. He recommended Cook for the position in his resignation letter. This ensures a smooth transition and there should be little disruption in the day-to-day operation of Apple. But day-to-day wasn’t Steve’s bit. Steve is the vision guy. Somehow – and nobody, probably Steve included, understands how – he has an incredible ability to pick winners. Apparently he pushed and pushed the design teams for the iPhone and iPad until he was satisfied…apparently he pushed them far more than other design teams at other companies do, as evidenced by their competing products. Historically he has been very demanding of his people, and very opinionated. He’s been able to do it because (a) he’s been mainly right, and (b) because he’s been right so often they make a lot of money. I don’t think he “invents” in the traditional sense of the word, but he “filters” – taking the ideas of others and determining which of those are the best and most marketable. That is a particular kind of genius. If you read a biography of Steve Jobs, you will see that he had absolutely no training for such a thing. He’s a college dropout, was kind of a Seventies hippie – slash – tech geek, but he has something – something you can’t learn at Harvard Business School. I don’t know where it comes from. I want to believe that without his guidance Apple will continue to innovate the way it has for the last decade and a half. The history of Apple from 1985 to 1995 doesn’t support that belief, of course. A parade of poor management almost destroyed the company. When Jobs came back, it was like a breath of fresh air. It wasn’t the design people who were at fault, but those who decided what direction the company should go in. In other words, the leadership. Somehow, Steve Jobs is a leader. He doesn’t fit most of the models that have been thrown out there the last few decades for what a leader should be, but you can’t argue with the numbers. He’s done the job, and far beyond. He deserves some time to rest and recuperate.